Calling all log marshaling companies and stevedores! Timbeter Container has released a new feature: QR codes detection. No need to measure the log diameters manually, now you can use the QR barcode reader to detect the information from the tags or codes. Now everything can be done with one picture! All the data is in digital form and can be easily shared or used for further processing. 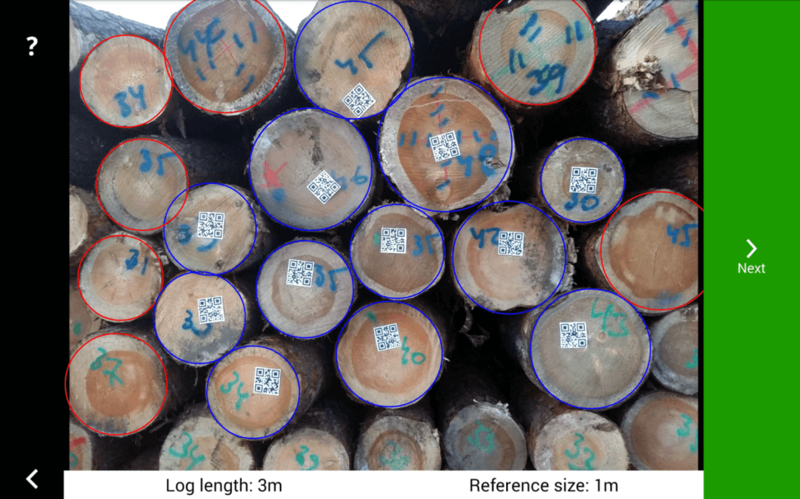 The feature enables to detect the log diameters (log count, diameters, volume) and read the information from the QR codes and link these two together. Both activities are done in parallel, so the whole process takes less than 3 minutes. Timbeter Container enables users to share the information about logs shipped in the containers quickly and effortlessly: a person needs to take pictures of all the packages loaded into the container and information can be easily shared via a link. All required data: number of logs, diameters of logs, volume, number of container and bill of lading is in digital form. In addition to the figures, there’s also real pictures of every timber load available so the receiving party can see the quality of the logs. As all information is in digital form, the data never gets lost as it might happen when written on paper. Besides that, all data can easily be made available for accountants and auditors, so no extra time spent on paperwork or data-compilation. Timbeter Container also reduces also the threat of potential human error. When logs are measured manually, it is easy to make mistakes either in the process of measurement, writing data to the paper or entering the information into an Excel sheet. With Timbeter all these potential errors are eliminated. Even if some logs are not detected automatically, this is instantly seen from the screen and can be added with just one fingertip. Same applies to the QR code: if there are any QR codes hidden or undetected, you have the option to scan the QR code separately. See the step-by-step description from our earlier blog-post here. It is also important to mention that Timbeter Container has incorporated JAS, GOST and cylindrical volume calculation formulas. All the need data is available also in Excel. All measurements can be seen and edited in the web-based storage module. Plus, all QR codes are editable in the storage module. Timbeter offer companies a free trial, so in case there are any doubts, Timbeter can be easily tested to ensure you are happy with the results. During the trial period, we offer full-support and notify you if anything is done incorrectly. Plus, we help you to find out the reason why for example the manual measurement and Timbeter’s results don’t match. Usually, there’s a straightforward explanation for that: typically there’s a question of reference, angle or volume formula. Our support team makes sure that even the most non-experienced user can finally get accurate results. So, if you want to minimize the time spent on measurements and barcodes detection, have all data structured in the correct way (bill of lading- the number of containers – measurements), eradicate the possible errors and share data easily; then you should start using Timbeter Container. No need for a separate barcode reader anymore. All you need is your smartphone. Download the Timbeter Container on Android and start measuring!